OMG, Aubrih! Drake presented Rihanna with the Michael Jackson Video Vanguard Award (and declared his love) with a heartfelt speech at the 2016 MTV Video Music Awards on Sunday, August 28. Watch the emotional moment in the video above! After four incredible career-spanning medleys of her hits, the Barbadian beauty took the stage at New York City&apos;s Madison Square Garden once again to accept the coveted Moonman following a heartfelt speech from her rumored beau. "The first time I met Robyn Fenty was 2005," Drake began his introduction, using RiRi&apos;s birth name. "She was shooting a music video at a restaurant called Avocado in Toronto. The song was &apos;Pon de Replay&apos; and the director of the video was Little X. I was introduced to her as a kid who played background music at the restaurant as people ate their dinner. It’s hard to believe that 11 years later all three of us would come together for a visual for a song called &apos;Work.&apos; Today, the world knows Little X as Director X. They know me as Drake and not the kid singing while you order pasta. But 11 years later, we still all know Rihanna as the one and only Rihanna." "Captivating from day one, the iconic being that is Rihanna was already at a place where most artists only dream of going. For them, that&apos;s often the peak, but for her, that was a starting point and she has kept ascending to an untouchable level ever since. When it comes to music, she relentlessly takes over the charts with every release. When it comes to performance, they swarm in masses just to be in her presence, obviously. And when it comes to fashion and style, she makes it seem so effortless until you try to do it yourself, which is when it gets a little awkward." The "Controlla" rapper continued, "What&apos;s most impressive isn’t the endless list of stats, awards and accomplishments. What&apos;s most impressive is the person. Some artists need to play a character to achieve success. Some need to downplay their own natural instincts to blend in. She succeeds by doing something that no one in this music industry does, which is being herself. This woman has surpassed all competition while still being the same girl from Barbados, surrounded by the same friends, speaking with the same accent and never missing a Crop Over unless it&apos;s to come perform at OVO Fest." "We love the music, which could change styles from album to album. We love the videos, which change their artistic vision from year to year. But most of all, we love the woman who hasn&apos;t changed since day one. She&apos;s someone I&apos;ve been in love with since I was 22 years old. She&apos;s one of my best friends in the world. All my adult life, I&apos;ve looked up to her even though she&apos;s younger than me. She&apos;s a living breathing legend in our industry. Ladies and gentlemen, the recipient of the Michael Jackson Vanguard Award for 2016: Rihanna." 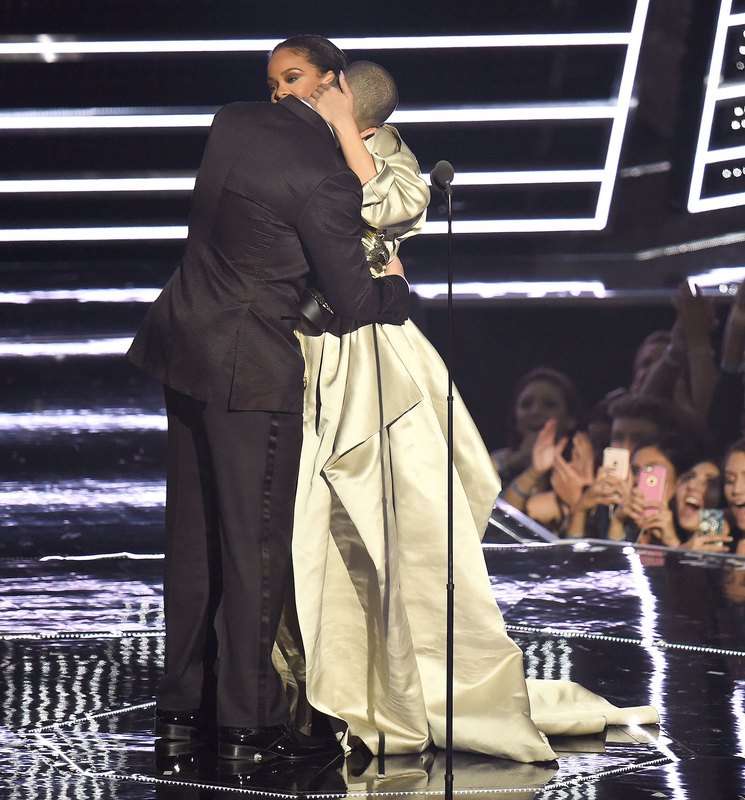 After giving Drake a big hug and what appeared to be a quick kiss, Rihanna took the microphone. "MTV, this is such an amazing night," she told the audience. "It&apos;s such an amazing moment in my career. When I think about the Vanguard Award and receiving this tonight, all I could think of was my country. They&apos;re gonna be so proud. This is the first Vanguard to land anywhere close to my country. My success, it started as my dream. But now, my success is not my own. It&apos;s my family&apos;s, it&apos;s my fans&apos;, it&apos;s my country&apos;s, the Caribbean as a whole, it&apos;s women, it&apos;s black women. So many people feel like their little piece is such a major part of this puzzle. I have to thank you guys for supporting me over and over. Thank you to every director who&apos;s taken a chance on me and my crazy ideas. There&apos;s so much growth that&apos;s happened over the last 11 years, and I can&apos;t believe I&apos;m receiving a Michael Jackson Video Vanguard Award at 28 years old. It&apos;s crazy, and I have so many people to thank." Over the course of her 11-plus-year career, Rihanna has been nominated for 23 VMAs and won four, including two Video of the Year, for "Umbrella" (2007) and "We Found Love" (2012). The "Needed Me" entertainer&apos;s acceptance of the Video Vanguard Award follows that of past recipients including Kanye West (2015), Beyoncé (2014), Justin Timberlake (2013), Britney Spears (2011), Janet Jackson (1990), Michael Jackson (1988), Madonna (1986), David Bowie (1984) and The Beatles (1984). 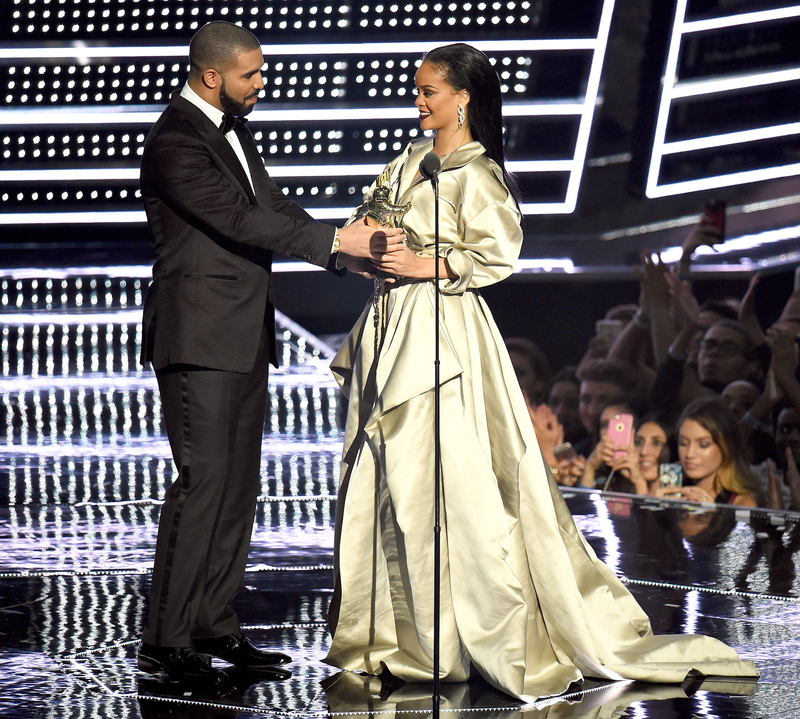 Watch Rihanna accept the 2016 Video Vanguard Award from Drake in the video above.